Personally I think the SIRT Pistol Trainer is one of the best investments for dry fire, instruction, martial arts, and just about any practice that you could use a pistol for. This past week Next Level Training created a add on for those of us who have RMRs on their pistol and I went ahead and picked it up. For $19.99 you get, well, not much, just a small piece of plastic that replaces the rear sight on your SIRT. In the rear it does have a back up notch that aligns up with your front sight post so you can still run it that way as well. I do wish though that it came with a higher rear and a replacement front post because a lot of people that run RMRs also replace their back up irons with suppressor height sights. So hopefully in the feature they will add a option for that. How the SIRT SPOT RMR Optic Trainer works is actually pretty clever. The SIRT itself has two lasers, one for trigger presetting and one for when you completely press the trigger. I almost ever use the presetting option, but with this it allows you to reuse it as the RMR red dot. So the first thing you need to do is adjust the laser to align up to where the red dot would be. For me I just aligned it to the fire laser to keep them in alignment. So when you set the trigger the laser shines and appears through the SPOT trainer. Systema Camp 2018 makes my fourth Systema camp. At the end of the last one in 2016 it was announced that the camp location we where using at the time was being sold and that a new location will be used in 2018. And just like in all the camps before, my plane arrived just after the buses left, which was no issue since I just road with the rest of the Dallas crew. Unlike the last three, we decided to not use tents this time, for they announced that this location had actual dorms instead of kids cabins. So we all decided to share one together. Even though each room was supposed to be labeled, it ended up being a free for all before we arrived and we ended up not in our assigned room, but a different one in the end with two other people. This ended up being a blessing for the two other guys we roomed with where great people, with one always running off to pick up alcohol for the after training parties. Just like in 2014, I shown up at Toronto international airport right as the camp buses were leaving, and just like in 2014 I thought well enough ahead to make travel arrangements with the camp. So for the ride up yo Systema Camp I basically had my own personal driver. On arrival Big Sergei was one of the first to greet everyone with a shot of vodka to get camp started right. Unlike in previous years, this year I brought my own personal tent instead of staying with a group. This made traveling a bit more cumbersome since I prefer to just bring everything as a carry on, but there was no way to make this tent fit in a over head bin. I quickly set up my site and met with everyone at the mess hall. At the last two Systema camps, you not only had Vladimir Vasiliev teaching but Valentine Talanov and Konstantin Komarov. This allowed everyone to break up into groups based on their skill level and topic they which to train in, but also allowed instructors to have some free time instead of teaching for 13+ hours a day. But this year Vladimir was basically teaching everything himself. 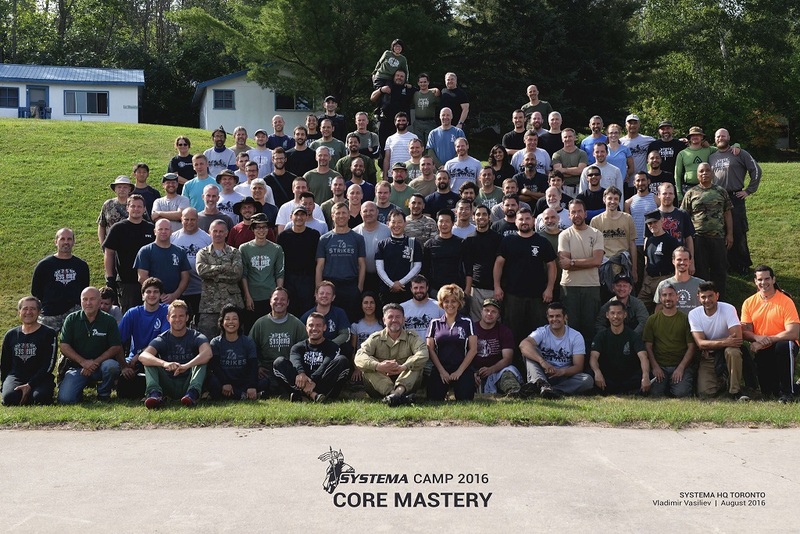 Other well established Systema instructors such as the Systema Twins (Brandon and Adam Zettler), Big Sergei, and few others where there to assist but it was mostly all Vlad.